And he’s with a young Danielle Rousseau and the rest of her ill-fated French science team. 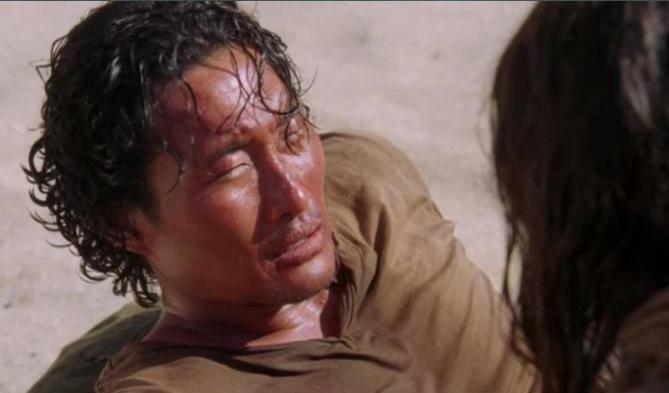 This is the second time Jin was caught in an explosion and floated back to the Island. Apparently, Jin had been caught in the same time flash as the rest still on the Island. Unfortunately for them, their brains seemed to be going all wonky from the flashes. Daniel hypothesized that the longer you have been exposed to the Island, the worse the symptoms become. What started as nose bleeds become worse as you flash. Charlotte had passed out once, perhaps her mind was time traveling at that time. Miles and Juliet have also shown the nose bleeds. Why Charlotte and Miles are being affected ahead of the others is still unknown. I love this time travel flashes. It allows us as viewers a chance to see some of the key moments of the Island without just hearing about it. Sawyer witnessing Kate helping Claire give birth was jarring for him, but an amazing scene for us. We get to know more about Danielle. Last episode we met an earlier version of the Others including a couple of characters that will become more important. It is a cool storytelling technique. And Sawyer’s reaction to the flash when they were on the outrigger being chased and shot at by the mysterious group was brilliant. A chunk of this episode dealt with the flash forward, specifically who had sent the lawyer to Kate’s for a blood sample. Who knows that Aaron is not Kate’s son? There is a misdirection that makes us think that Claire’s mother is the one, but she is still in the dark. It isn’t hard to figure out that it was Ben doing this. It felt like his slimy maneuver from the start. When Kate confronted him, his admission of guilt and his “sorry” was classic Ben.